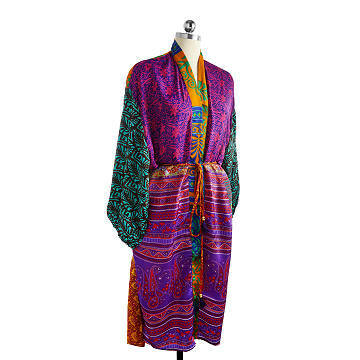 Skilled Indian tailors craft these multi colored kimonos from vintage saris collected by local traders. Vintage Indian saris are given new life in this multi patterned Japanese-style kimono. They're collected from Indian homes, one by one, by trading in exchange for essential household items. Skilled tailors in Rajasthan, India cut and sew them by hand into floaty midi-length robes. As each is made using cuttings from different saris, they're all unique blends of colors and patterns. The result is an inviting silhouette that's perfect for spa nights and lazy Sunday mornings. Sleeves have gathered wrists, and the wraparound belt is finished with brass beads and a small fringe at each end. Designed in Canada. Handmade in India. Hand wash delicate in cold water. Hang to dry.